[Speaking-Out-Loud February 2016] Ways to zap the fillers - um, err, yeah and like. Have you ever been put on the spot and asked to say a few words with little or no preparation? 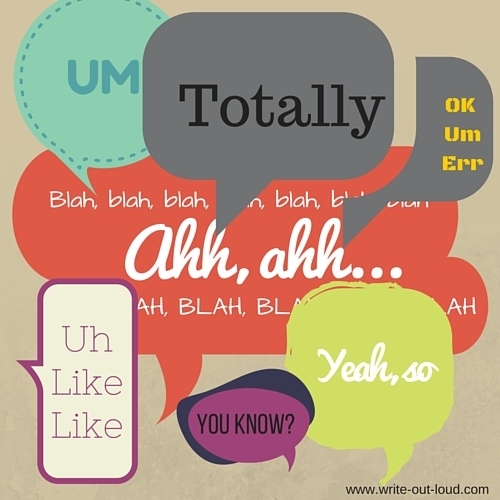 It can be enough to cause an outbreak of the dreaded speech fillers. Those ums and ahhs are called disfluencies because they break the fluency or smooth flow of speech. or a mixture of both. Regardless of the underlying cause an excess of disfluencies or fillers undermines your message. Try the sentence below aloud and really listen to yourself. Do you believe what you're saying? "Yeah, well, um, I'd just like to say, um, like, you know, I think this is, um, a great opportunity and um, yeah, you know, like I can't wait to get started." How do you know if you've got a bad case of fillers? It's not the sort of thing that many people will tell you about. Generally it's considered rude, poor form, to comment on another person's habitual speech patterns. Nevertheless that doesn't stop us from making judgments! Here are two ways to find out for yourself. What do you like about your present job? Listen to your answers and take note of the fillers. 2. Ask a friend or trusted colleague to count them. Tell them you're on a mission to reduce the number of fillers you use in your everyday or unrehearsed speech and that you'd like them to note every instance they hear one over a specified time. Five or ten minutes should be enough. This will give you a list of your habitual phrases or disfluencies, and the frequency of their use. Now that you know what you do, how do you STOP using fillers? As you become more conscious of what you are actually saying, rather than what you think you are saying you will quite naturally start to substitute fillers for fluency. A method I find useful is to pause. Take a breath. Give yourself a moment of silence to gather your thoughts before speaking. To speed your progress give yourself regular conscious practice. Here's a bunch of impromptu public speaking topics to get you started. Record yourself. Five minutes a day for a week will make a huge difference. Keep those recordings. To monitor your progress, after a couple of days replay the first few recordings you made and compare them to the most recent. For more on structuring and presenting your thoughts well check these impromptu speaking templates. You'll find a collection of useful organizers. Andrew Dlugan's excellent 2009 post on Filler words in public speaking - Are… um… Filler Words… ah… Okay?. It attracted a lot of useful and interesting comments from public speakers. A definition of filler words with examples from About.com's grammar and composition expert Richard Nordquist. Help! What interactive activities do you use with large audiences? My friend Teri Yanovitch (retainloyalcustomers.com is a regular and sought after keynote speaker on customer service. She would like to know what interactive activities have you found stimulating and successful with audiences of 100 plus. Perhaps you've been a participant. Or maybe you've been the speaker and used something special to involve your audience. Do you have suggestions? Can you help? Teri and I have been chatting about this and we decided to include you in the discussion. We thought multiple heads would be better than two and we're looking forward to hearing what you have to say. Please send your suggestions in by replying to this email. Thank you. If there's enough interest we'll share your recommended activities in the next newsletter. I love finding articles I want to share! Here's the first of three: The Interrupted Story: One Way to Tell a Story in a Speech. Speaker Christopher Witt outlines a technique I am going to have to try. Secondly, English writer Neil Gaiman on Why our future depends on libraries, reading and daydreaming. And the last of three - presentation expert Carmine Gallo Talk Like TED: The 9 Public-Speaking Secrets of the World's Top Minds. This is a video of an hour long presentation given to Microsoft research staff. Fascinating - and well worth watching. And I'd love to see you on write-out-loud.com's face book page too.